The iOS line is gearing up to be a viable contendor in the video game console world, thanks largely to the new wireless AirPlay video mirroring feature coming in iOS 5. It works like this: an Apple TV2 becomes a wireless receiver that an iOS 5 equipped iPad 2 can then export it’s screen to, the TV can then either mirror the iPad 2 display, or if an supports it, the TV can display different images than what is on the iPad 2, turning the iPad 2 into a controller. Yes, that means the feature is currently limited to iPad 2 in beta 1 of iOS 5, but I suspect that will broaden to the rumored A5 equipped iPhone and possibly other iOS hardware through some jailbreak tweaks. 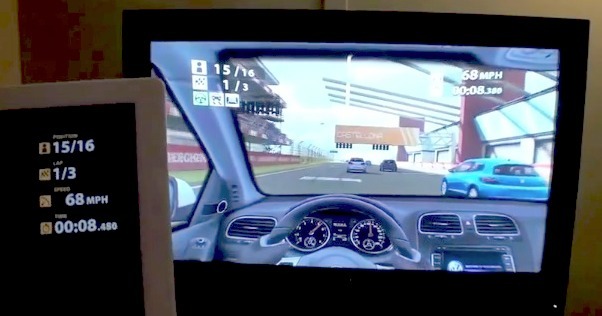 This first video shows the iPad 2 exporting Real Racing 2 at full screen to an Apple TV2, there is a mention of some lag here and there, but for beta software it looks amazing. The brief lag could also just be the result of network interference, poor wifi reception, or not using an 802.11n network. As of now, not many games support the full wide-screen video export, which is why games like Angry Birds show the black bars on the sides. This isn’t shocking when you remember that the release date of iOS 5 isn’t scheduled until sometime this Fall, but I suspect many games will offer full AirPlay support by then. Finally, don’t forget that iOS 5 supports 1080p playback too, which makes the console potential even greater. This is interesting, as this is a little similar to what the WiiU is trying to accomplish with their new controller scheme. Well, not only game, but now videos! And now the feature “allow AirPlay to now show anything on your iPad on an Apple TV” is great! BTW, the iOS 5 is really cool, the ability to play 1080p vids really makes me exciting! Then maybe I don’t need to do so much converting with iFunia. Maybe could make the Apple TV to be a HTV centre. That’s so great!